Some guns are simply too big and heavy with too much kick. Since there's no use in owning a gun you can't handle, Charter offers a compact, lightweight revolver chambered in .32 H&R - easier to carry and more enjoyable shoot. 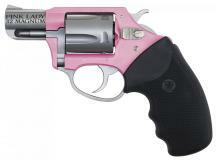 The Pink Lady Undercoverette has a high-grade cast 7075 aluminum frame with a pink finish and stainless barrel and cylinder. A three-point cylinder lock, fixed front sight and black rubber grip round out this gun that is sure to become a favorite for conceal carry.